Sitting on the 18th flor of Windy Hill Dunes, is where you’ll find this massive re-modeled five-bedroom, four-bathroom oceanfront penthouse. The first thing you see when you walk into this beautiful unit is the Great Atlantic Ocean, making this a perfect vacation getaway. 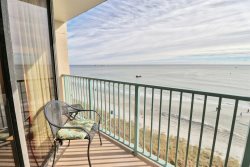 Enjoy the beautiful breath-taking views from this penthouse balcony that goes along the entire length of this unit. In which also has access from the master bedroom. The unit has two king-size beds and five queen-size beds making it able to sleep up to 14 guests comfortably at once. The Master bedroom features the massive king-size bed overlooking the Atlantic, a master his and hers styled bathroom. The second bedroom with a queen size-bed with a flat screen TV and its own bathroom. Third bedroom come with a king size-bed, flat screen tv and its own bathing as well. The fourth and fifth bedroom have two queen size-beds in each room, a flat screen TV and share a Jack and Jill bathroom.There's a full size washer/dryer and an iron & ironing board and hair dryer for your convenience. The living area features two sectional couches back to back so there is plenty of seating for everyone. In addition, there is a giant “70”in flat screen TV also located in the living area perfect for the big game night with the entire family. The kitchen come complete with a wet bar, granite counter tops, full size refrigerator, stove/oven, microwave, dishwasher and all the cookware/dishware you will require during your stay. Seating up to 14 guests in the dining area you can enjoy a table seat meal with first row seats of the Atlantic and it coastline. The Windy Hill Dunes Resort includes, a swimming pool, relaxing lazy river, hot tub and children’s pool. So, come enjoy your stay at the Windy Hill Dunes! There is a .03% Processing fee added to each reservation.